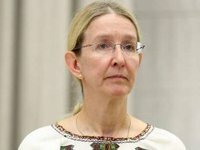 Some 3,382 cases of measles were detected in Ukraine during 11 months of 2017, including five deaths, Health Minister Ulana Suprun told reporters on Thursday. According to her, all the lethal cases were recorded in Odesa region, where three children and two adults died from this disease. "Back in September 2017, when serious outbreaks of measles disease began in Ivano-Frankivsk, Ternopil and Odesa regions, we established a headquarters for the Health Ministry and recommended that in these areas we limit the stay of unvaccinated children in children's groups - schools, kindergartens. Ternopil and Ivano- Frankivsk regions heeded and their incidence declined, and Odesa region continued to allow children to go to school without vaccination. After the death of five people, they finally realized that this should be banned, and now they demand that children be vaccinated," she said, while adding that almost 80% of measles were not vaccinated. Suprun also reported that at present the measles vaccine is in sufficient numbers in all areas. She recommended, in the case of information on the lack of vaccines, to report this to the Health Ministry's hotline or to the agency's Facebook page. "We will be able to answer you how many vaccines are available in your area, or redistribute, if there are no vaccines for some reason in your area," she said. Previously, the Health Ministry reported that in Ukraine over the past 15 years, outbreaks of measles have been recorded three times: in 2001, 2006 and 2012. In particular, 13,000 people had measles in 2012.